Transfer almost any old video media to DVD or Blu-Ray or digital file. 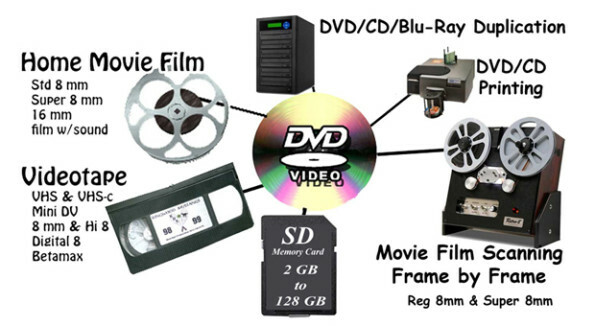 We Transfer Most Anything to DVD, Blu-Ray and CD Home Movie Film, Videotape, Std 8 mm, VHS & VHS, Super 8 mm, Hi 8 & Digital 8, 16 mm, Mini DV & DVCAM , Silent & Sound, Betamax / Laser Disks. Your memories in video may recover a new life.